Islanders face severe threat. Can they convince the world? The world's small islands have more to lose from runaway climate change than perhaps anywhere else on Earth. Pacific and Caribbean islands have been battered recently by historically destructive hurricanes that endangered residents and stalled economic development. Cyclone Winston last year was the strongest storm ever to touch down in the Southern Hemisphere, while this September was the most active month on record for hurricanes in the Atlantic Basin. Sea-level rise is already eating away at low-lying islands and jeopardizing shoreline economic activity. And some, like the Marshall Islands, Fiji, Tuvalu, Kiribati and Vanuatu, may see large strips of territory disappear by the end of the century. "We live in different parts of the world, but the reality is that we're all threatened by climate change, and what really binds us together is the existential nature of the threat from climate change," said Selwin Hart, the ambassador of Barbados to the United States. The risks to islands will be showcased on the world stage as delegates convene at the global climate change conference in Bonn, Germany, over the next 10 days. This year, Fiji has the presidency of the U.N. talks, and it's prioritizing the concerns of its residents in the South Pacific and other members of the Alliance of Small Island States (AOSIS). These islands are united in forging a future despite dire scientific predictions. They've been the moral conscience of U.N. climate talks for decades, reminding reluctant nations of the damage they would feel if rising temperatures are left unchecked. "People understood that this wasn't just about great nations, powerful nations, coming to an agreement," said Sen. Brian Schatz (D-Hawaii), who met with island leaders at the Paris summit two years ago. "This was about understanding that those most impacted by climate change are often in the weakest position to do something about it." So far, Fiji Prime Minister Frank Bainimarama and his team have focused on containing greenhouse gases rather than on reparations, a provocative issue that raises objections among wealthier nations. But that conversation might be inevitable, especially if the Paris Agreement fails to meet its goal of tempering the world's thermostat. Fiji is already looking ahead: It's named next year's re-evaluation of progress toward the Paris Agreement the "Talanoa dialogue." It's an island term for "sharing stories, building empathy and making wise decisions for the collective good." The scope of the dialogue, to take place next year at the summit in Poland, may be the Fijian presidency's most important legacy. Over the next week, the road map will be charted toward those talks in 2018. Discussion of the $100 billion that developed countries have agreed to provide to poor countries by 2020 to cope with warming will not occur until the second week of the conference. And no significant new developments are expected on the issue of loss and damage. But islands say they're still looking to Fiji's "Islands Conference of the Parties" to provide a turning point on assistance to vulnerable nations. The Warsaw International Mechanism was established in 2013 to consider how climate-related damage would be addressed. But progress has been slow. "We want that to accelerate and make sure that the bigger countries are more serious about this and have in place mechanisms, especially when disaster strikes small islands," Thoriq Ibrahim, environment and energy minister for the low-lying Maldives and chairman of the AOSIS, told E&E News recently. "They should be able to get up on their feet and start their livelihood again. To do that, we need to have some sort of mechanism, and it's still not there." Islands are making their own plans as they wait for international help. In many cases, that means uprooting local populations, often from ancestry homelands, and moving them to higher ground. Fiji moved its first village, Vunidogoloa, in 2014. More than 30 other communities are slated for possible relocation. Chief climate negotiator Nazhat Shameem Khan, who is playing a leading role in this year's COP, told E&E News recently that the government is not making villagers leave. Instead, it will try to win consensus. "The participation process is very important," said Khan. "We're almost redrawing the rules about with whom to talk." Traditionally, decisions like this would have fallen to male elders of the village. But Khan said the Fijian government is making a point to engage women and children ahead of any possible move. "If you're going to build a school inland, should you ask the children when you're moving the school? Should you ask the children do you like the school there, or would you prefer it there? And they'll say, 'We like it there, because there's a playground for us,'" she said. "Climate change and relocation policies have a transformative agenda," she added. "They have the capacity of actually changing society and making it equal, inclusive, participatory." Even if relocations are voluntary, that doesn't make them less traumatic. Fijians and other island cultures have a religious link to the land and water, and to the places their ancestors are buried. "We cherish our culture and religions in the village and [those are] two main things that we continue to teach our children today, as it is what we will be known for," Sailosi Ramatu, Vunidogoloa's village headman, told E&E News via email through a translator. Vunidogoloa's roughly 100 citizens often return to the original site of their village to spend time with their ancestors. It's not far from their new location. "We go there to fish because it is near the sea, and sometimes we just go there to reminisce on our past memories," he said. Before the move, the village experienced landslides, and children had to cross two rivers to attend school. The new village is more convenient, but Ramatu said the decision to go is still very controversial with villagers. "Many villagers thought that climate change would go away, but over the years they realized that we cannot stop its effects but we can relocate and live a better life if we move," he said. Internal relocation is also the plan in the Maldives, where the new government has proposed moving thousands of people away from its less-developed islands and consolidating the population on more densely populated islands. Officials believe these areas can be better protected from rising seas. There are plans to sell some evacuated islands for tourism development, and the Maldivian government says the revenue would help give the island nation a future. "We are building safer islands," said Ibrahim, an engineer. Most of the nation is about 1.5 meters above sea level, a threshold that could easily be breached by the end of the century if current projections of sea-level rise occur. The goal is to fortify some islands and to construct others that will be high enough to exist into the next century. Hulhumalé, a project proposed near the capital of Malé, would be home to 150,000 people from other islands. It relies on a giant sea wall. "We don't want to move, and we are not moving," said Ibrahim. "We are adapting. That is what we are doing." That's a popular refrain by island representatives, who insist that leaving their homelands due to sea-level rise would be a tragic option that is not yet under consideration. "No Caribbean person or diplomat that I've ever spoken to has contemplated the issue of migration," said Hart. "No one wants to leave their island." The Polynesian island nation of Tuvalu, for example, turned down Fiji's offer of land as a possible relocation site. "Tuvalu's policy is that we will stay in Tuvalu and try to adapt to the impacts, that is why the government has funded from its own pocket coastal reclamation projects," said Simalua Enele, Tuvalu's assistant secretary for foreign affairs. The country has also received funding for coastal adaptation projects through the Green Climate Fund. 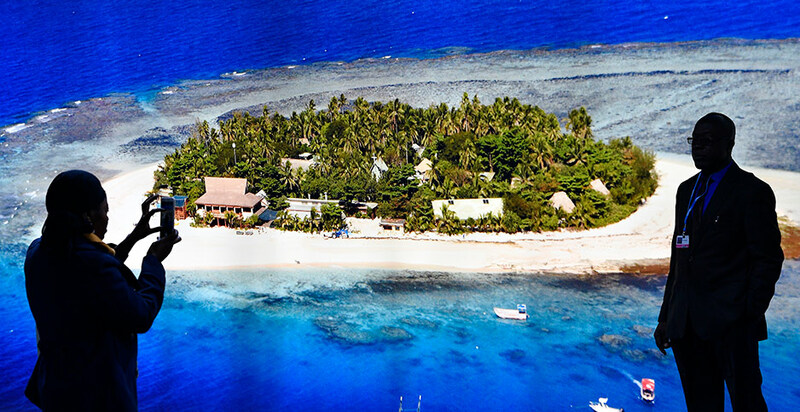 Kiribati took Fiji up on a similar offer, buying 8 square miles of land on one of Fiji's islands. Anote Tong, the president of Kiribati at the time, told the Associated Press in 2014 that "we would hope not to put everyone on [this] one piece of land, but if it became absolutely necessary, yes, we could do it." Tong is a climate advocate and a proponent of what he called "migration with dignity," which emphasized preparing the Kiribati population to have the job skills it would need to thrive away from its homeland. Island adaptation requires money — and the rich world has not been forthcoming. Wealthy nations still haven't explained how they plan to fulfill their pledge to provide $100 billion to poorer countries. That uncertainty heightened when President Trump vowed not to provide the United States' contribution. The Paris Agreement took liability for loss and damage off the table, though there's some doubt about whether that language would be binding. Ronald Sanders, the U.S. ambassador for Antigua and Barbuda, says islands should take a more aggressive tone in Bonn after this year's damaging hurricane season. "I think the argument for damage, for compensation, has never been stronger than it is now," Sanders told E&E News. Barbuda was devastated by Hurricane Irma in September and has no permanent residents for the first time in its 300-year history. Antigua, which is normally home to 80,000, is hosting 1,600 Barbudans and 3,000 Dominican refugees made homeless by Hurricane Maria. The economic consequences for Antigua include higher poverty rates, higher insurance premiums and more infrastructure costs to make the island better able to withstand future storms. "And for what? We didn't create this problem," said Sanders. "We are its victims. This damage was caused by the profligacy of others. "And the people who are most profligate in it are not accepting responsibility for the damage they are doing to our countries," he added. He penned an op-ed on the website Caribbean360 on Monday proposing a suite of compensation measures, including debt forgiveness and asking for help paying for insurance premiums. Western governments that have historic ties to the Caribbean have been slow to offer relief after this year's hurricane season. Sanders said Caribbean countries have been generous with each other — Dominica offered Antigua and Barbuda $200,000 after Irma before being decimated itself by Maria. But Sanders credited Venezuela and especially China with stepping in with resources the West is not providing. "Were it not for China I don't know what the Caribbean would have done," Sanders said. China gave Antigua and Barbuda and Dominica $5 million after the hurricanes. China's planned investment in Latin America and the Caribbean runs in the hundreds of billions over the next decade, and Sanders said that gives China long-term influence. Hart of Barbados says international lending institutions can help Caribbean islands by giving them access to grants and financing. Booming tourism industries and rich expat residents have skewed national gross domestic products in the Caribbean, leading them to be classified as wealthy nations. That can leave them unable to get assistance from development banks. Meanwhile, a single Category 5 hurricane can cause damages in excess of a country's GDP. But Hart also touted plans by Caribbean nations to spend resources to become a global model for climate resilience. "There is a recognition on our part that climate disruption has now become a permanent feature in how we map out our development," he said. "So if we are to survive as sovereign states, we need to take climate disruption into account in terms of planning for the future."